I suppose it's the exact opposite of being a foodie to admit that you like something as plebeian as a hot dog, but I do. Hot dogs from the street vendors in New York. Hot dogs at Pink's on La Brea. The one I really miss is Tail O' The Pup. You know it even if you don't know it. It's been in movies like Body Double, Ruthless People and LA Story. It was one of the last vestiges of "programmatic" architecture in Los Angeles. They served hot dogs, obviously, and fries and onion rings and soda. They were first on La Cienega, then forced out in the 80's to make way for the wholly unnecessary Hotel Sofitel. They moved a block away to San Vicente where they stayed for quite a while until they lost their ground lease to the promise of GLBT elderly housing. A decade later, it's still an empty lot. I had the single best star sighting ever at this place. Ella Fitzgerald enjoying her onion rings while her Mercedes Landaulet with liveried chauffeur waited at the curb. To this day I am jonesing for an extreme (chili and cheese dog) with onions. So; hot dogs, yay or nay? Yay. We don't have them often, but in the summer here in our corner of the Midwest a popular item for community fund raisers is the hillbilly hot dog. It's a grilled dog topped with chili, coleslaw and chopped onions, and they're delicious. Oh yes! My beloved and I went to see "Hyde Park on Hudson" a few weeks ago, and then afterwards were inspired by the movie to snarf hot dogs. Hebrew National is my dog of choice! I'm a vegetarian, so nay. But I guess the same argument could be made about Chipotle and Jimmy Johns' subs. Can't hardly stand to even be around hot dogs, but I love Ella Fitzgerald and onion rings! How do you feel about Dodger dogs? 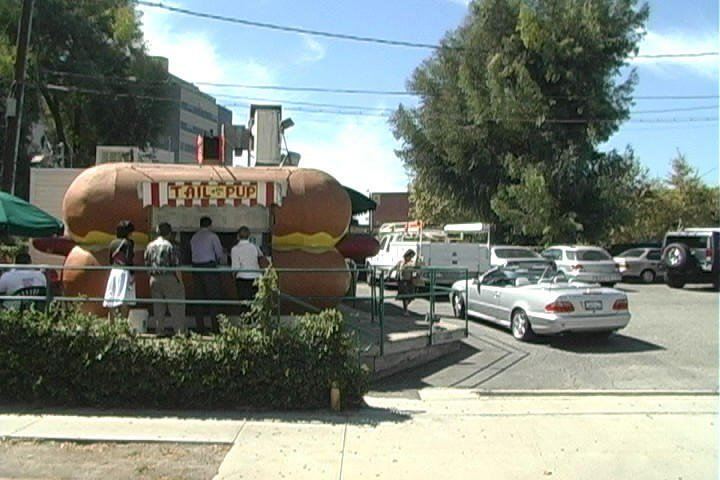 Tom Robbins' book Another Road Side Attraction is as much a homage to the hot dog as Jitterbug Perfume is to perfume. Worth the read. Well worth the bite. Besides, sauerkraut is supposed to be one of the new "superfoods". Here is one really embarrassing fact. Sam's Club and Costco make the best hot dogs at their cafe, if you can even call it a cafe. Kosher, all beef of course, steamed with a steamed bun and relish, sauerkraut, onions, catsup and mustard. I gotta admit, I love me some hot dogs - grilled, not steamed or boiled, and with sweet relish on a toasted bun. Oh yeah! I miss those roadside places too - we have at least one left here in Portland, a giant milk carton rotating over a dairy plant, but the ones from my New England childhood were much better. I never knew there was a word for what they were - "programmatic" does not give any hint of whimsy or fun. Yay! We had hot dogs this weekend with Cincinnati style chili (several of my friends hail from there). There are few things that can beat a hot dog cooked over a fire. My favorites are Smith's hot dogs (found in PA with a casing) and Hebrew Nationals, of course. Ketchup, mustard and onions please.